﻿My relationship with exercise, specifically running, is complicated. In a lot of ways, running is good for my mental health. It helps me to calm down and release energy when I am anxious or hypomanic and it lifts me up when I am depressed. Running also generally helps me to think through things and process complicated feelings. I even had the inspiration to write this blog while I was running. However, given my history with an eating disorder, running is not always healthy for me. [image description: The words “However, given my history with an eating disorder, exercise is not always healthy for me” are written in pale yellow. Behind the words is the previous image of Ria leaning against the fence with an orange wash]. I started running as a means of weight control in the early stages of my eating disorder. I developed bulimia at the age of 13 and for years I was stuck in a cycle of restricting, binging, and purging. I associated eating with personal failure and felt irreconcilable guilt when I felt I had overeaten. I told myself that I was worthless and disgusting and that I deserved to be reprimanded for overeating. Running, like purging, was a form of self-punishment and I would not stop until I stopped feeling guilty. It was not uncommon for me to run until I cried or was near the point of passing out. As eating disorder behaviours often do, running became a compulsive, addictive behaviour. It didn’t matter if I was exhausted, or injured, or unwell, I had to run. I couldn’t stop myself from acting on impulses to engage in compensatory behaviours after I had eaten, no matter how damaging they were to my physical and mental health. The health consequences of my disordered eating and exercise eventually caught up with me, and after I was hospitalised for severe dehydration and malnutrition, I took the first steps toward recovery. I worked to develop a healthier relationship with food and exercise, and for a while, this meant refraining from running altogether. [image description: image of Ria leaning on a white fence taken from the side. You can clearly see a ring on her left hand, which has the eating disorder recovery symbol. She has brown braids which are magenta and blonde at the tips. There are orange and yellow vertical stripes on the right-hand side of the image]. I had to learn to sit with my compulsions to engage in disordered eating and exercise. 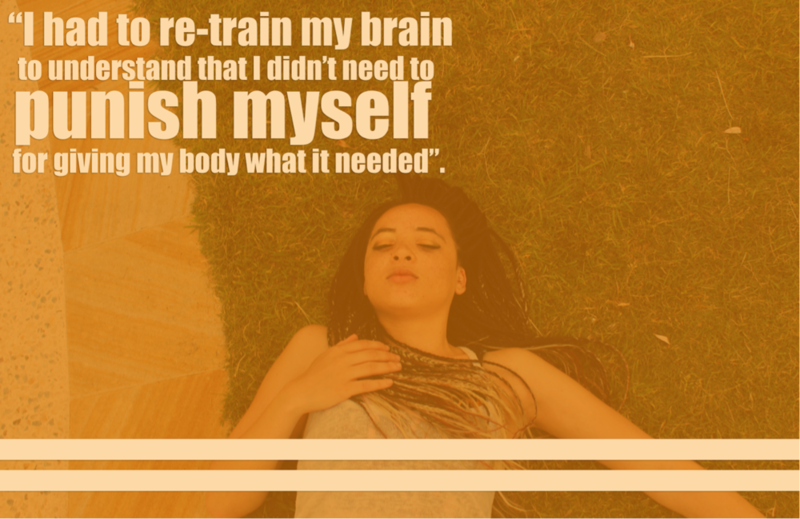 I had to re-train my brain to understand that I didn’t need to punish myself for giving my body what it needed. It sounds simple but it was not easy. It was worth it though. [image description: the words “I had to re-train my brain to understand that I didn’t need to punish myself for giving my body what it needed” are written in pale yellow in the top left of the image. In the background, there is a photo of Ria lying on grass with her eyes closed. Her right arm is placed naturally on her chest and her left arm is stretched out. The image has an orange wash]. I started running again in college, for different reasons. With my eating disorder relatively under control, my moods started to fluctuate more intensely than ever before. During what I later learned was hypomania, I had more energy and anxiety than I could manage. I overworked myself in an attempt to expel my overwhelming mental energy, but I still could not slow down my thoughts and I could not sleep. I was exhausted but my energy was inexhaustible. Running helped me to clear my head and maintain my sanity when I felt like I was unravelling. [image description: the words “running helped me to clear my head and maintain my sanity when I felt like I was unravelling” is written in pale yellow. In the background, there is an image of Ria dancing in a white crop top and an orange skirt. The image has an orange wash]. To this day, running helps me to manage the most agonising aspects of my hypomania and anxiety; racing thoughts and insomnia. When I feel like I cannot keep up with my racing thoughts, I become overwhelmed, impulsive, and occasionally self-destructive. Running feels like the only time I am moving as quickly as my mind is, and I have a better chance at getting some sleep when I have been running that day. When my mood drops and I become depressed, running also helps to lift my mood and provide some relief when nothing feels enjoyable. It is rare to find something that works to manage both depression and hypomania, so running has become extremely valuable to me as one thing that I can keep constant in the tumultuous bipolar experience. [image description: Ria is sitting on a sandstone pavement with her knees bent. Her arms are placed casually over her knees and she is smiling and looking away from the camera]. I now run regularly, given the benefits that it has for my mental health. But finding a way to keep running in a healthy way was, and still is, challenging. Exercise in itself is enough of a trigger that I can slip back into thinking, that’s not enough, keep going, work harder and I occasionally cross the line from healthy to excessive exercise. There are times when I have gone out for a run to clear my head, in the hopes to feel better, only to come back exhausted, triggered, shaking, and in tears because I couldn’t help but push myself past my limits. There is an exasperating irony in exercising to improve my mental and physical health, only to make it worse. I am still figuring out how to manage my complicated relationship with exercise. I have found some ways to set boundaries for myself in the process of redefining a more positive relationship with exercise. For example, it helps me to set time limits on my runs, and when that time is up I need to remind myself (or even set an alert on my phone) that I have done enough exercise. A friend and fellow mental health advocate (@the.extra.ounce) also suggested choosing a particular album and only exercising as long as that album – as a music lover I have found that this approach works quite well for me. Managing my relationship with exercise also involved a change in mindset. Running became a lot healthier for me when I changed my focus from self-punishment and weight control to self-management and wellbeing. Although, this is easier said than done. Sometimes, I simply need to recognise that exercise is not the healthiest solution for me when I am vulnerable, because it has the potential to escalate to the point where it is no longer healthy for me, and even that recognition is a positive step. 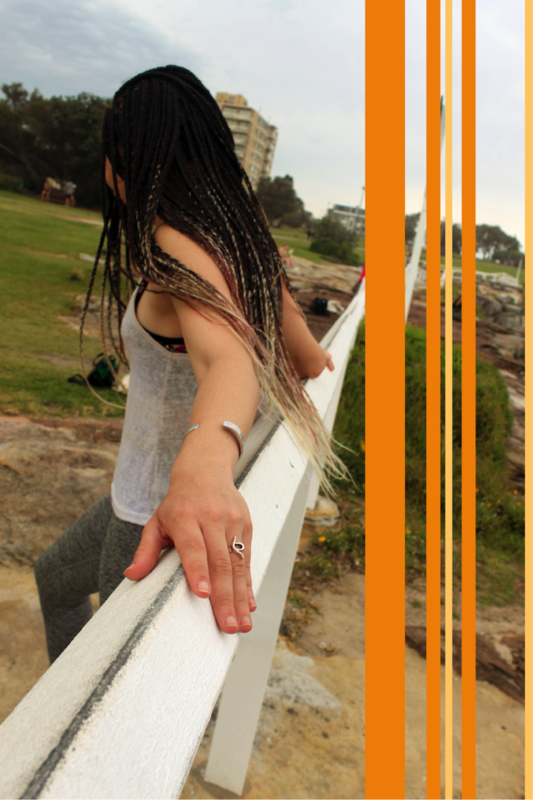 Ria is an Australian/Tanzanian mental health activist and aspiring psychologist. She is passionate about sharing her lived experience to improve mental health awareness. Ria shares her story at high schools with Batyr and is a peer ambassador for SANE Australia. Recently, Ria established her own blog, Mai Mental Health (@mai_mental_health), to write about her experiences and speak out about various mental health-related issues. Ria intends to practice as a psychologist after she finishes her Masters of Clinical Psychology, and she hopes to specialise in eating disorders. Outside of her work in mental health, Ria enjoys singing, dancing, and travelling. Follow the Unicorn Community! Email me if you’d like to connect!